Let me begin with a disclaimer. I am not defending any accused. I hold no brief for rich drunken drivers. I just want the law to be the same for everybody. Rich, poor, educated, illiterate, male, female, film star, driver, government employee, politician, gangster, whoever. The law and the punishment must be the same for everybody. Sadly this is not the case in our country. In the wee hours of June 9, corporate lawyer Janhavi Gadkar crashed her Audi Q3 into a Maruti Eeco taxi killing two people. Earlier in the night, she had several pegs of whisky at a well known bar and later went to one more pub where she drank lots of beer with another colleague. Janhavi was clearly drunk and driving on the wrong side of the Eastern Freeway in Mumbai when the incident occurred. The police arrested her and charged her under the Indian Penal Code with Section 304 (II): Culpable homicide not amounting to murder, 337: Causing hurt with an act that endangers the lives or personal safety of others and also 338: Causing grievous hurt with an act that endangers the life or personal safety of others. Under the Motor Vehicles Act she has been charged with Section 183: Driving at excessive speed, 184: Driving dangerously and 185: Driving drunk or under the influence of drugs. All very serious charges. As I write this, Janhavi Gadkar's bail has been refused and she is still in jail. Her lawyers argued that 'culpable homicide not amounting to murder' is a wrong charge as she was involved in an accident. The magistrate rejected this and Janhavi's lawyers will challenge the refusal in a higher court. Now let's look at few other cases (more on www.accidentsinbharat.com). On that same day, June 9, four persons, including two children, died and nine others were injured (three seriously) when their van got crushed by a trailer truck on the Expressway near Vadodara. One of the survivors stated, "The trailer slowed down and we tried to overtake it. It took a sudden turn without any indication and crashed into us." The local police said, "The trailer driver is absconding and we have initiated investigations." Please note - the driver is not named. There is no way of knowing if he was drunk or under the influence of drugs. Unlike in Janhavi's case where the media went ballistic, there was just a passing mention of this. The driver has disappeared and in all likelihood will never be found and shall soon be driving again. On June 5, 22 people were killed and 25 others injured in north Maharashtra when a State Transport bus collided head-on with a speeding container truck. Police have filed a case. The absconding drivers are not named in reports. In time to come, the case will be closed. Again no media outrage, no nothing. 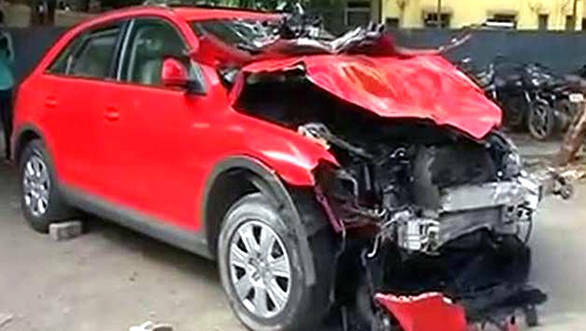 On June 8, five men were killed and two others injured in Madhya Pradesh when a truck rammed into their car. Police said, "The truck driver fled the spot. A case has been registered and investigation is underway." On June 8, four women, including a pregnant one, were killed near Manor when the driver of their vehicle rammed the vehicle into a stationary truck. The police said, "A case has been registered and investigations are underway." On June 13 in Uttar Pradesh, 17 passengers, including 12 women and five children, were killed and around 30 others injured when a speeding truck collided with two tractor-trolleys. Case registered. No arrests. On June 12, 14 passengers died and 20 others were seriously injured in Punjab, when the private bus in which they were travelling slid off the road and dashed against a tree. The police is investigating the cause of accident. No mention of the driver. The bus slid off - it's as simple as that. On June 27, two women on a scooter were knocked down and killed by a double decker BEST bus in Mumbai. The bus driver tried to flee but the passengers stopped him. The Bandra Kurla Complex police said, "The women were riding on the right side of the bus. The bus driver might not have noticed them." Bus driver Dhamse was arrested and a few hours after the incident was produced before a court and immediately released on bail. Is this fair? While the police are rightly making a watertight case against the lawyer Janhavi Gadkar, they are deliberately diluting the one against the BEST driver. I am quite sure he will never go to jail and will be driving again soon. Just like so many other drivers who flee after crashing and killing. Yes, in incidents involving trucks, buses, taxis etc, it's normal for the drivers to simply flee the spot. As these are not high profile people, the media ignores these cases. The police too just register a case and do not actively pursue the culprits as there is no media pressure, or even any political interest or gain in such cases. But when a well-off, drunk lady lawyer has an accident in her expensive car, the media makes it front page news. The police arrest the culprit and make a very strong case against him or her. Then our judiciary ensures justice is done. This is very good. But when will every accident be treated in the same manner and when will the enforcement of law be the same for everyone?